The meaning of the row and column names. A serial mode column of Integers. 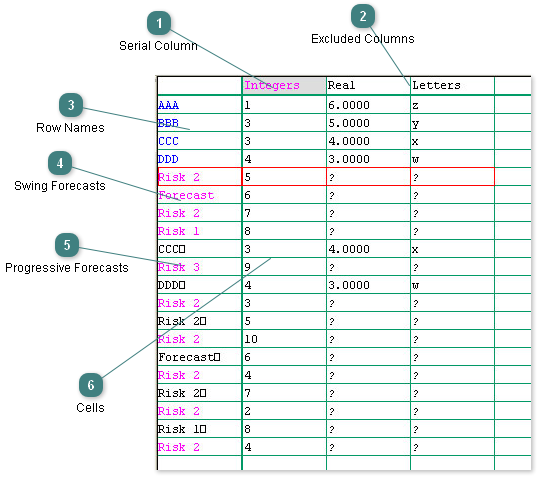 Only serial mode columns are forecasted. Two excluded columns with real numbers and letters. Excluded columns are not forecasted. The original four rows with names. Four Swing forecasted rows. The rows names show the risk level for each row. If the name is Forecast it means that there is no risk. Progressive forecasts with row names showing the risk and copies of the original row names. As forecasting continues copies of the forecasts are used for further forecasts. The grid cells contain the original and the forecasted values.